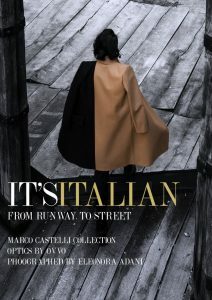 Marco Castelli has idealized the Bicolor coat with very precious materials and with a careful measure on the details. Strengths of Bicolor coat are the handcrafted care, fabrics and style. Handcrafted care: each piece is dedicated an exclusive time from design to packaging, from the choice of fabrics to the hand finishing each model is tackled and take care of in every details. Fabrics: Accessory, fabric, models and everything is at hand so that every customer can actively participate in the choice and creation of their own dress, once exclusive, guided by the technical know-how and the artisan experience of seamstresses. Style: Timeless beauty and practically are the main coordinates that guide the style of tailoring classic forms revisited by innovative devices and technological fabrics that suggest new interpretations of timeless elegance. Our Bicolor are available in our shop online in two different fabrics Wool or Cashmere colors Camel and black, navy and black , ice and navy, red and black and many others. 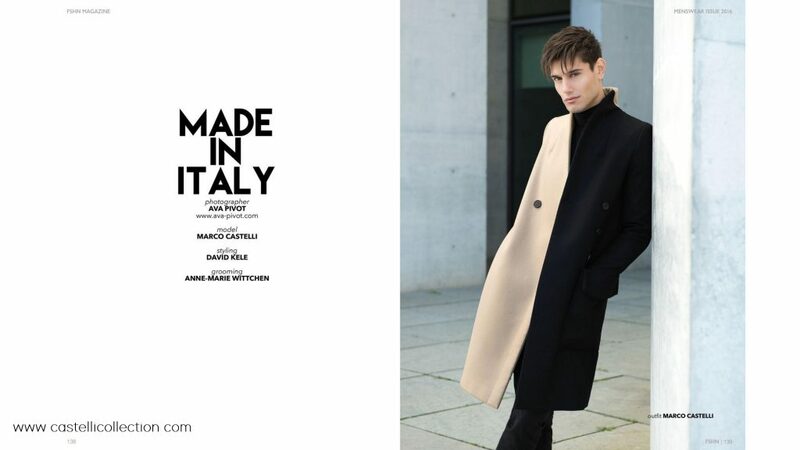 Below some photos of our Bicolor Coat Castelli shoot in Milan Berlin New York. This image was shoot in New York during NYC Fashion week. 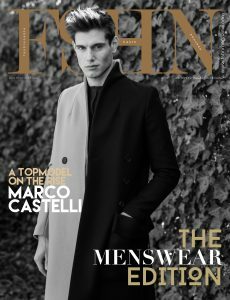 In the cover our Creative Director Marco Castelli captured in Berlin for FSHN MAGAZINE caption of cover ”A TOP MODEL ON THE RISE” the menswear edition. Mr Castelli wearing our Bicolor, So what do you think of this peace? T. C. “when i wear it people won’t stop look at me, it’s crazy. this peace are incredible because you can wear with jeans as casual and in the same time with classy style. A. A. Style are great and the quality are perfect.